Fitted straight into the existing location and started right up. Very good fit. Postage exellent. Can fully charged. 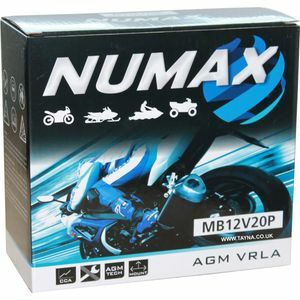 Used on both a BMW Paris Dakar & R1200C that are laid up for long periods (Winter). Delivered very quickly, fitted perfectly. 21A which is better cranking amps than the oem at 19. Excellent product, well packed and ready for use. Good price and a nice quick delivery, that makes a change for this area.Happy to recommend this company. Happy with both the Service and the Product. Fitted To: BMW K100 RS 998cc B.
I needed a replacement battery for my BMW R1150RT quick. I ordered it and received it quickly and I Was back on the road extra fast. I have already recommended Tayna to my friends. very good. arrived well packaged and very promptly delivered. more important was that it fitted and works perfectally. superb value for money thanks very much!! sound product at a sensible price. prompt delivery and all very simple to deal with start to finish.no hesitation in recommending Tayna's products & service. only quirk - and it's a daft one, the parcel said 'this way up' and when opened the battery wasn't, it was on its' side.